Flooring Hut is the cheapest supplier of flooring underlay on the web. Stocking all the leading brands, Flooring Hut’s large stock holding facility enables the company to offer delivery straight to the customer’s door in nearly all cases. Flooring Hut also offers flooring accessories and customer advice on the best materials and techniques. Our brief was to create a website that included an online shop, which would support Flooring Hut’s mission to save customers money while offering a seamless and straightforward user experience. 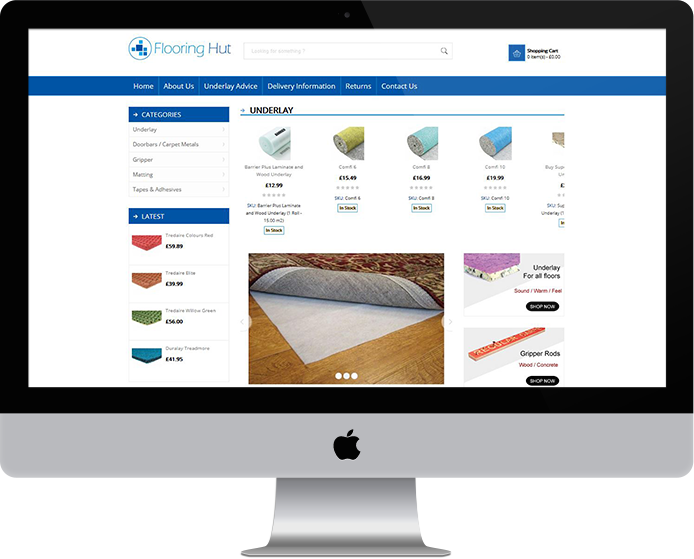 It was important to ensure the new website’s online shop supported Flooring Hut’s existing eBay selling site, so that customers could be passed smoothly between the two. We chose an OpenCart solution which allows customers to easily see the range of underlay on offer, and buy it with the fewest possible steps. This also interacts with the eBay selling site – orders from eBay are imported into the shop, allowing Flooring Hut staff to manage the full product range and deal with customer orders using just one system. Another primary consideration was search engine optimisation (SEO). Because Flooring Hut is a web-only business, SEO and customer reach are vital. Targeting the high to top-end keywords for Google meant that Flooring Hut could reach a new marketplace and has successfully increased sales in a very short space of time. This ties in with the use of eBay for selling and Amazon Marketing, both of which also extend the website’s reach. The resulting website is centred around an easy-to-use shop which creates smooth and easy customer transactions. Thanks to this usability, combined with efforts around SEO and reach, Flooring Hut’s sales have significantly increased.